Living life in crescendo still has its setbacks. 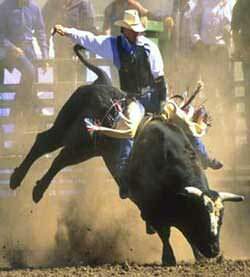 Picture your BHAG as riding a bull. Sooner or later, you’re going to get thrown to the ground. As Vince Lombardi says, “It’s not whether you get knocked down–it’s whether you get up.” And the longer you stay down, the harder it will be to get back up. Hospitals force patients recovering from major surgeries walking the following day in order to get their bodies functioning again. Running from problems doesn’t solve them either. Certainly it’s prudent to throw in a hand once in a while—the “know when to fold ‘em strategy”, but escaping a problem hardly ever opens the door to bliss. If you live life in crescendo and get thrown down to the ground, here are 5 steps to help you pick yourself up, dust yourself off, and get back in the action once again. Reflect on what happened: Could anything have been done to prevent or minimize your mishap? Dwell on the positives: What did you learn, and how do you apply it to reboot? Take baby steps: Don’t get back on your horse and proceed to gallop. Setbacks require healing so slow down to eventually speed up. Enjoy the journey: Once you are refocused and again driven toward your goal, appreciate each day for what you are doing to move you closer to your goal. Being defeated is a temporary set-back; only by giving up do you make it permanent. As Immanuel Kant says, “Happiness is not an ideal of reason, but of imagination.” Set your mind on a vision of who you want to be and passionately pursue this purpose.